Take the stress off potty training by bringing some lightweight humor into it. 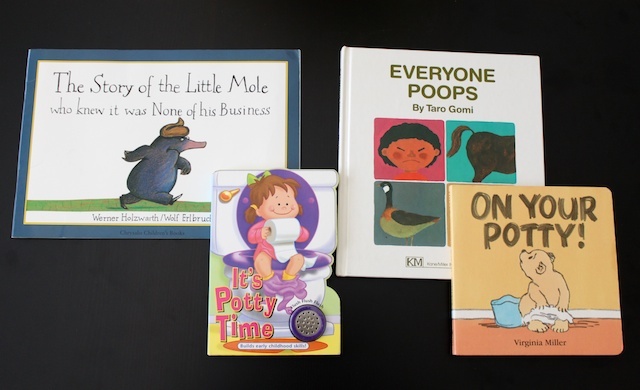 Here are some potty books that may get your child interested and motivated to sit on the potty. The Story of the Little Mole Who Knew it Was None of His Business . I purchased this in London. It’s a disgusting yet all the same time an educational book about the different types of animal poop. Everyone Poops . Humans and animals eat and therefore we poop. Really. It’s OK to poop. It’s Potty Time . It comes in a girl version and boy version. And a button that makes the flushing sound. The New Potty Little Critter . Can’t go wrong with the Little Critter, right? Although, this one is a bit girly. On Your Potty! . Not a lot of words to this one. But the gist of the book is what I liked. A little bear who says he doesn’t need to go potty. Then he realized that he does need to go and makes it just in time. » Tell me… What is your child’s favorite potty book? Read other potty training articles… 22 Potty Training Tips for Modern Moms, back to basics tip for auto-flush toilets, your potty training questions answered, download a free potty training chart and adventures of modern mom story about when they revert. Thank you so much for all your potty resources. I’m still very nervous about potty training my little one but now I don’t feel so overwhelmed. You’re posts have given me the confidence I need to tackle this dreaded milestone. Having had three already & one more to go through this, I’m basically wholly against “training” because they really will learn on their own timetable without too much fuss or fanfare & that’s so much less stressful for them & you than really pushing it. That said my favorite potty book (& we’ve been reading it a lot lately, my daughter’s almost 2 1/2 ) is Tony Ross’ I Want My Potty. I do believe he’s Australian. Oh is it FUNNY. My kids liked an old Muppet Baby book called “No More Diapers.” (They also have a “No More Pacifiers” book that helped too). They starred Miss Piggy. But our family’s personal favorite potty training media was a VHS of Bear In the Big Blue House. They have an episode titled, “When You’ve Got to Go.” It’s a hoot! We have officially had potty training success! But my 2 yro favorite potty books is Once Upon A Potty. He started loving it at like 16 months and we would read it like 5 or 6 times in a row. He loooooooves that book. There’s a movie too, but that wasn’t a hit. OH this is so timely. I am embarking on the potty training journey with my twin girls and officially scared to death. Monday is the day we start…these books are great! Thanks for the tips! We just got one from the library called “POTTY”. It’s about zoo animals trying to fit their butts on this little child’s potty. My son loves it. that sounds like a cute book. will have to look that up!